Last night, I was invited along to the launch of a new service from BT – BT MyPlace. Unfortunately, it all got called off with the weather; they’d sensibly decided that it may have been a little difficult to demo a service that would involve us wandering around outside. BT MyPlace is a ‘pocket concierge’ system, for wifi devices. Register some of your preferences and when you are out and about – and can connect to the BT Openzone system in Westminster, you’ll be served relevant content. It’s a very local service, looking at the choices on offer, it’s focused on tourists. You don’t need to access over BTWifi though, as it seems to work perfectly well over standard connection. To get it set up for the first time, you have to register on the site. Interestingly, I expected the confirmation to be sent to my phone, but instead it’s an email. On reflection, that’s because not all mobile wifi devices are phones, in fact, most aren’t if you consider laptops. Next set your preferences. The UI on this site is a little raw to my eyes. 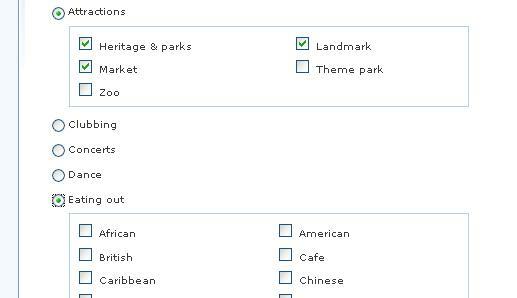 The links to setting preferences are tucked away at the top, within preferences you have this weird mix of radio buttons and check boxes. My first thought was that I could only choose one type of preference, as radio buttons are used for exclusive choices. At this point, I’m a little stuck. I’m going to try it out for real on the phone, but test searches were not overwhelmingly good when sitting at the desk whilst not in Westminster. I’m going to have to give it a try out in the outside world. I like the idea, it’s a good collaboration between BT and Westminster Council, I’ve just not seen it in action yet. This entry was posted in mobile, technology by Rachel. Bookmark the permalink.